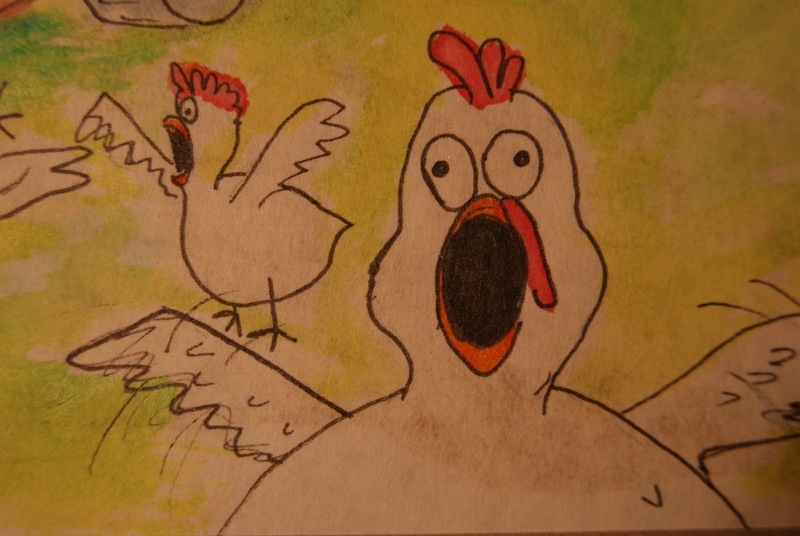 I’m taking an art class at the theatre department and we’re working with gouache. I’d never worked with the medium before, so it’s been a new experience. What’s nice about gouache is that it has a higher pigment than watercolor, but you can layer it like watercolor. 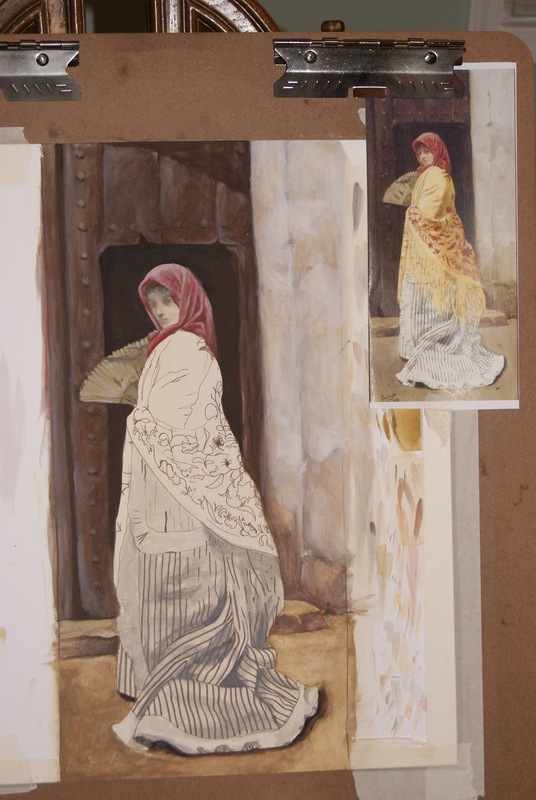 We’re recreating a painting for our project, the theme being “Orientalism.” I chose one by Jose Gallegos y Arnosa, a painting called “The Yellow Shawl” painted in 1881. Here are some progress pics thus far. A new life for my couch! After being married and moving into a new place, we took in a lot of free stuff. Everyone seems to have stuff they don’t need in their home so many people gave us their old things to furnish our house with. This is great! Especially for an extremely frugal me, who hates to spend money on anything unless it’s a necessity…. well unless it’s fabric or yarn or antique. One of these freebies was a couch. A very comfy couch. And I recovered it! Same comfort, Better style. 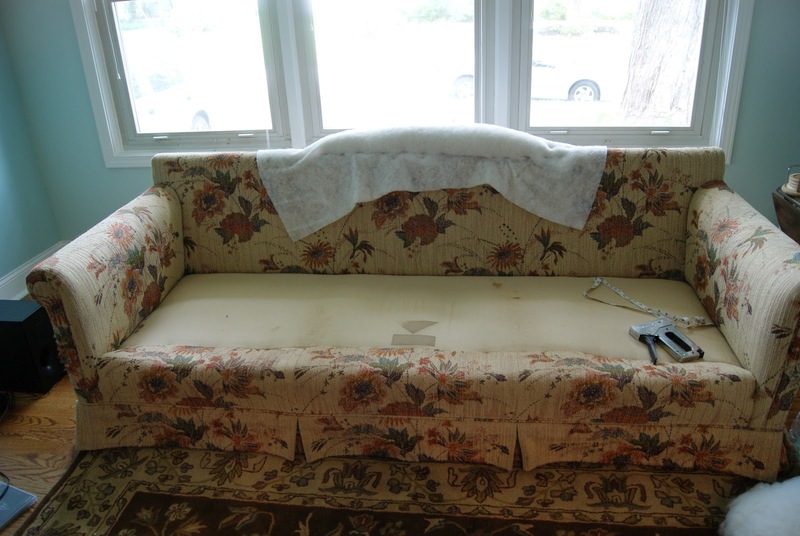 For $100 I transformed my blah couch into a pseudo-antique looking one! This particular couch came from my in-laws and happens to be one of Devin’s favorites. It’s seriously one of the most comfortable couches I’ve had the pleasure of sitting on. It was just so, well, ugly. 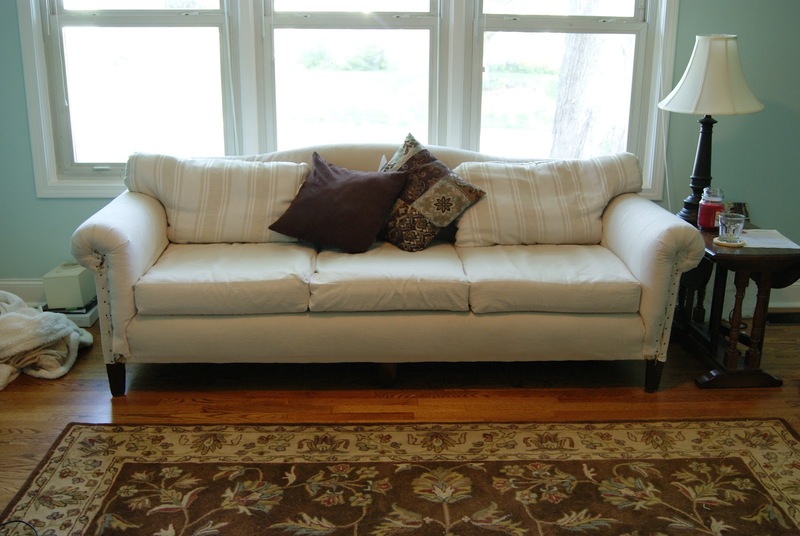 I wanted to recover the couch but I do not have the money to put out for upholstery fabric because of course, I only want the most prettiest, expensive, light tone-on-tone upholstery fabrics that cost a gazillion dollars per yard. So I had conceded that I would have to put that idea out of my mind. But, having found a brand new addiction for Pinterest (if you would like to follow my boards, click the link! 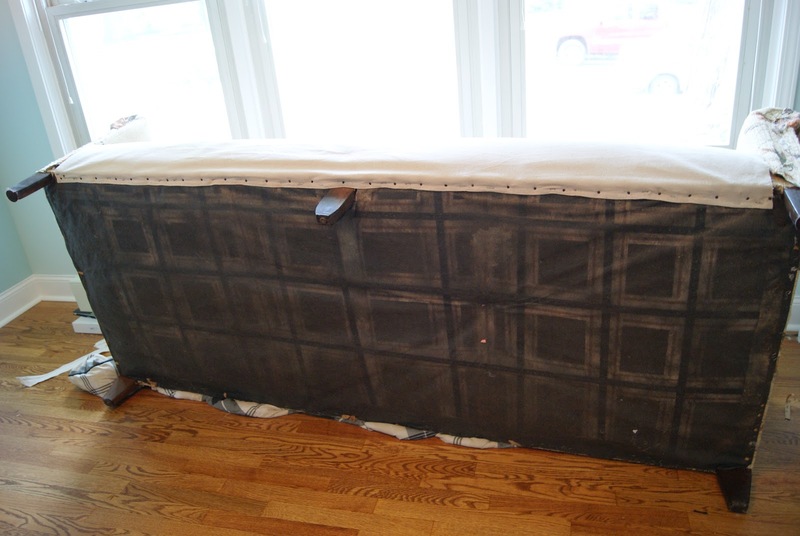 ), I started seeing all these pictures of people using drop cloth as a sofa cover! What a wonderful idea! 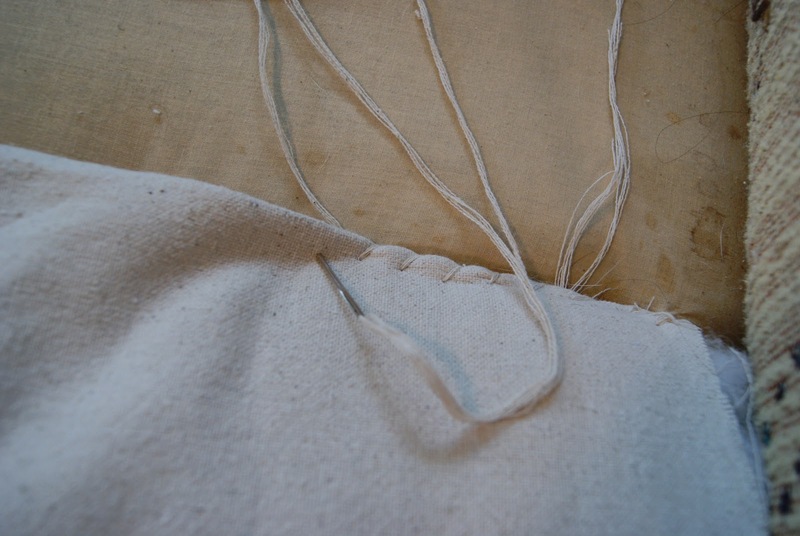 I thought, but I realized… making a slipcover is a LOT of work and I greatly dislike working with piping. Blech. 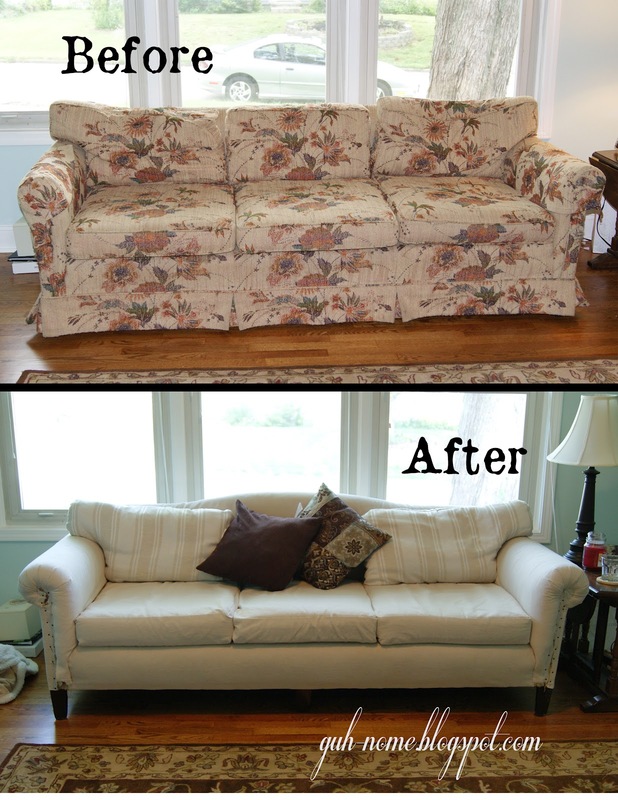 Luckily though, another pinner had posted her own adventures in upholstering with a drop cloth and the results were great! I read her post, watched a couple of videos and decided to attempt it on my own. 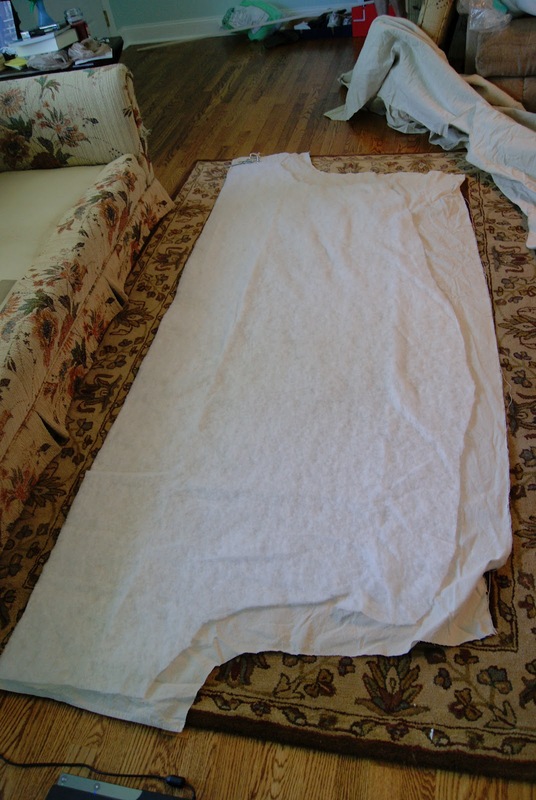 First, I washed the drop cloth 3 times and dried it with softener… it took FOREVER. But I’m glad I decided to soften it, because boy it was not comfy before. 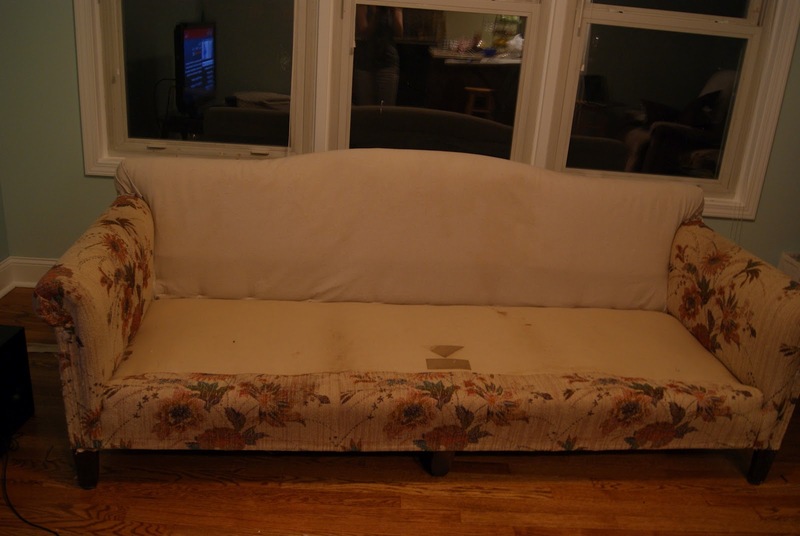 After that I analyzed my couch and figured out what I wanted to do with it. 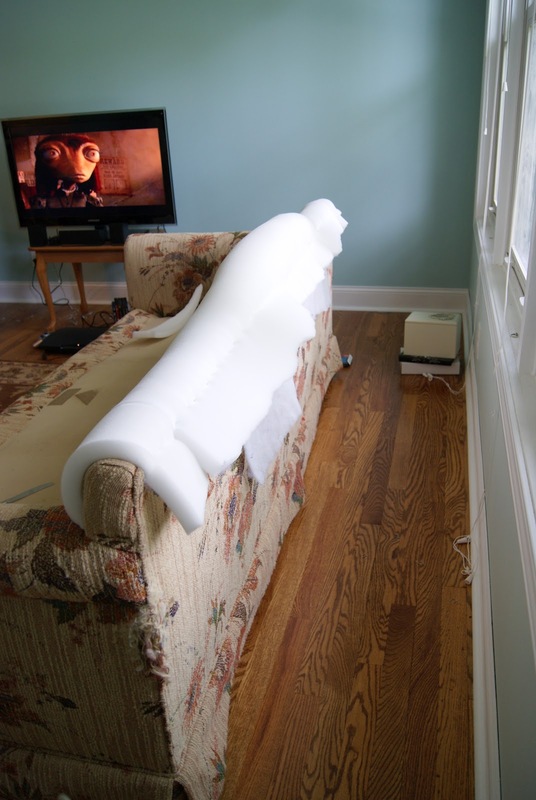 I wanted a “camel back” or “hump back” to my couch, so I used a lump of the polyester stuffing material and stapled it in place with some quilt batting. This part was interesting because we had to pack the stuffing so tightly. Also, finding the wood support beams took a little trial and error…. and frustration. 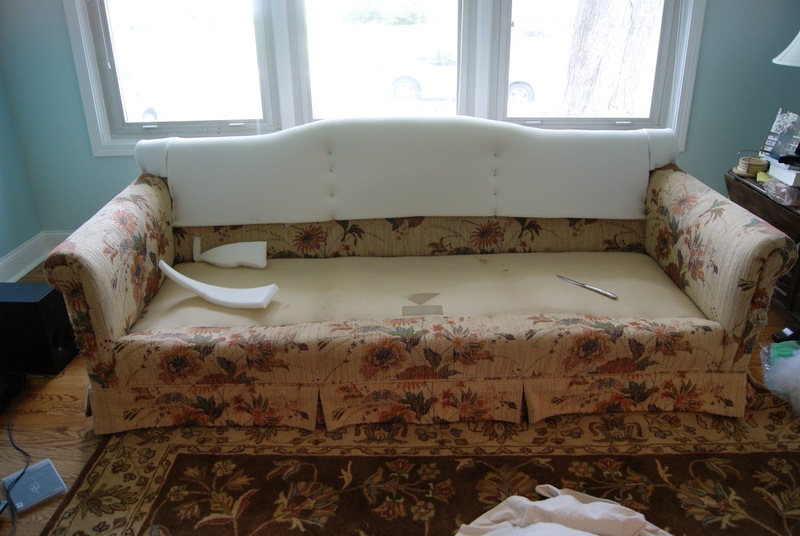 After the hump was made, we then stapled the upholstery foam to the back of the couch to smooth everything out and to make the back a little cushier. More quilt batting was added atop this and cut to size, then we laid the batting out to use as a pattern to cut the canvas (being extra sure to add lots of seam allowance to the sides) Then the batting was stapled into place. 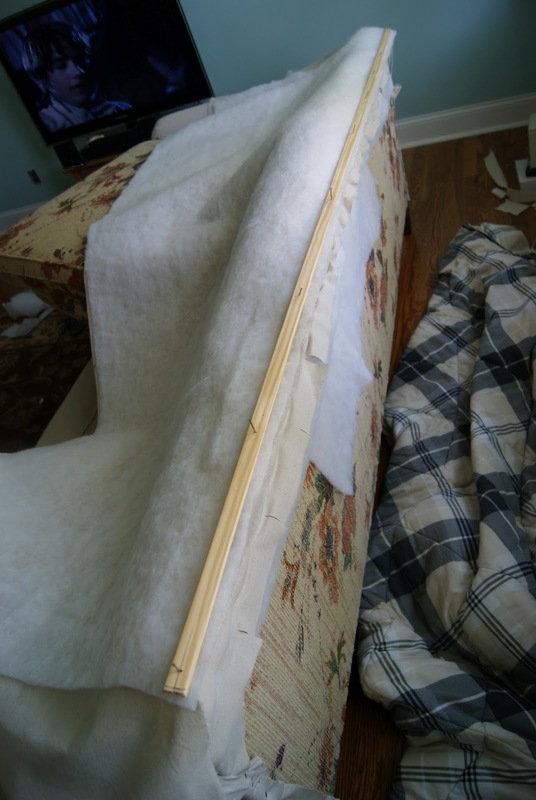 After the back had been padded with foam, we added the canvas, stretched, stapled and pleated to fit. 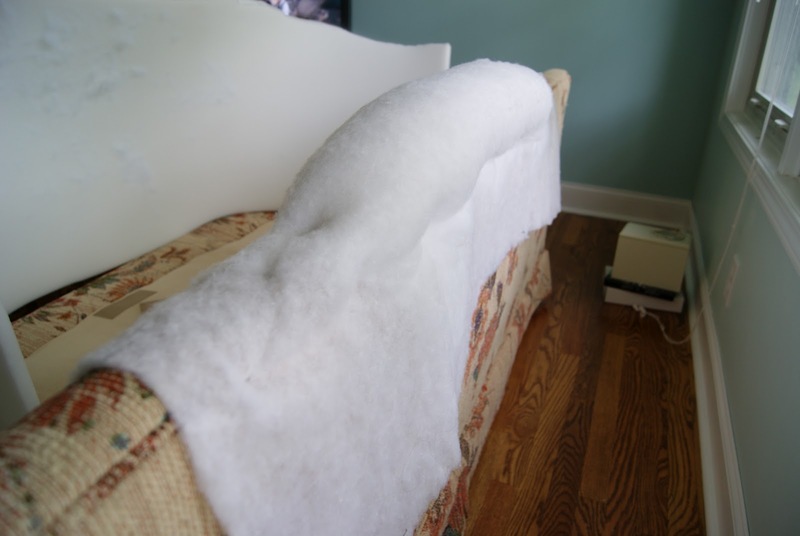 The front lip of the sofa proved to be far more challenging than I anticipated. All of the support beams were covered in springs and knots, leaving me completely helpless as to what to do next. I had figured I would just staple the fabric to the support beams and be done with that process, but ended up taking another route. I laid batting on the “decorative fabric” of the lip, so as to cover up the weird pattern, then laid a strip of the canvas atop; stapled and tacked the fabric to the bottom, then whip-stitched the canvas to the original upholstery. This took me 2 hours and my pointer finger is still somewhat numb after 2 weeks. I used 6 fibers from the canvas for the thread and a giant tapestry needle. 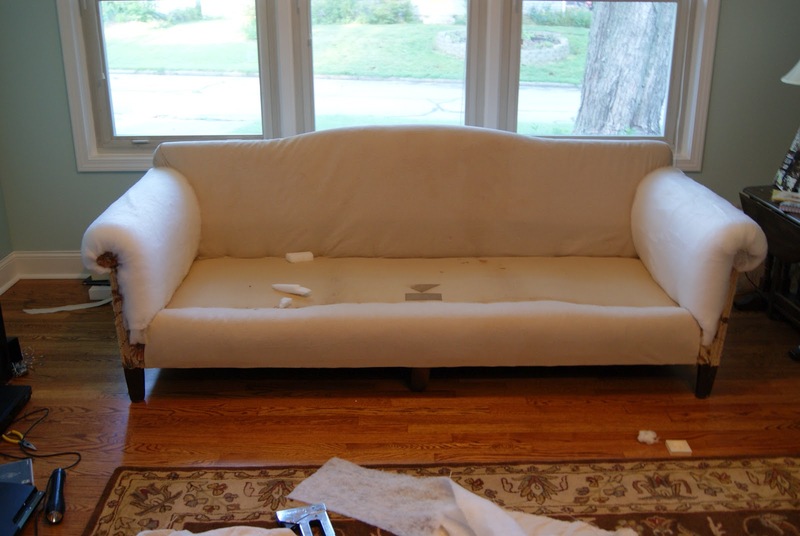 A similar process as the back was used for the arms of the sofa, apart from adding “stuffing” to the arms. 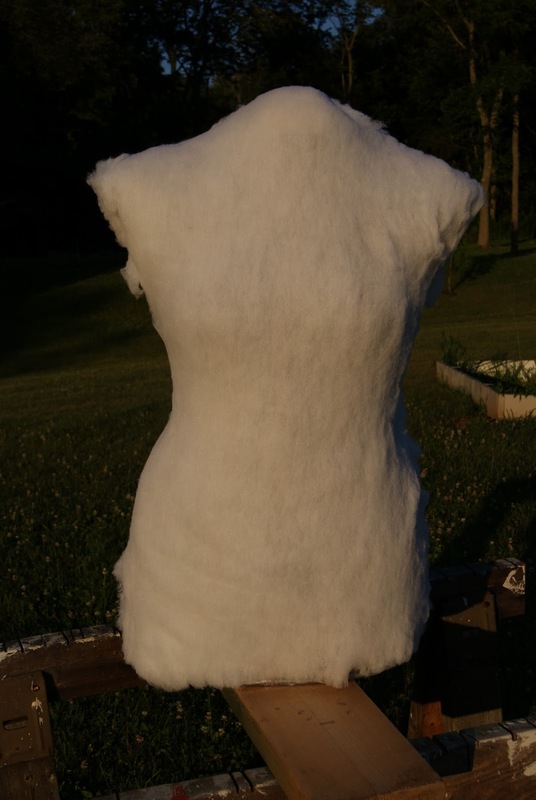 Foam was added directly to the top of the arms and the process followed how we went about the back. Batting to the right arm, so you can see the difference. Next step I did the underside of the arms. Using batting for a pattern, then cutting the canvas. The hardest part of this was making sure the staples and cut tacks wouldn’t be seen. 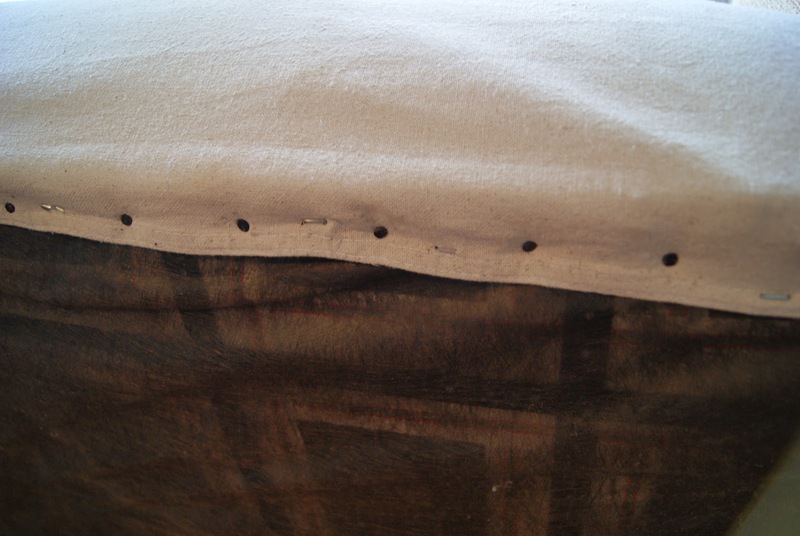 I stapled the fabric and batting, right side to couch, underneath the crest of the armrest then folded the piece down, to cover the staples and tacks. 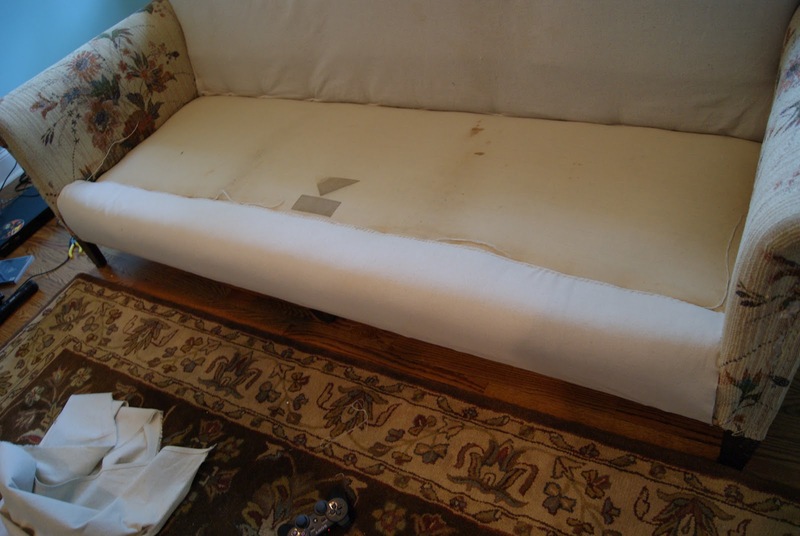 The fabric was then stretched and attached to the underside, back and front of the armrests. 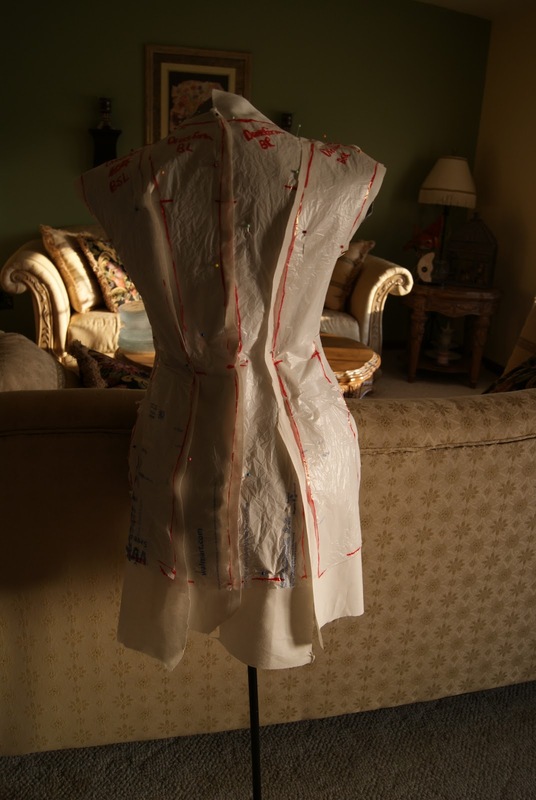 The last, and hardest non-sewing part, was the final back piece. Like the under-sides for the armrest, the staples and tacks shouldn’t be seen, but one also wants the line to be completely straight. 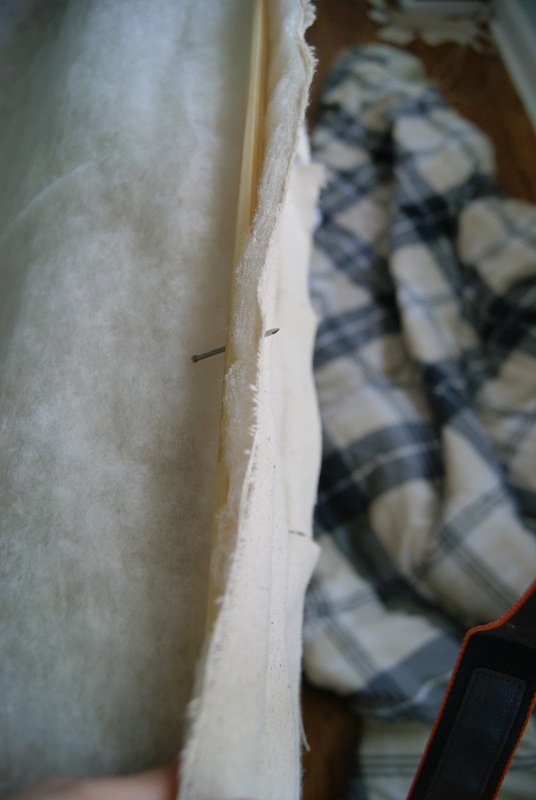 The only way to achieve this ( the sturdiest, longest lasting way) is to make a tack strip with finishing nails and a cheap piece of trim, nail it to the back of the couch, then fold the fabric and batting over the strip to conceal it. 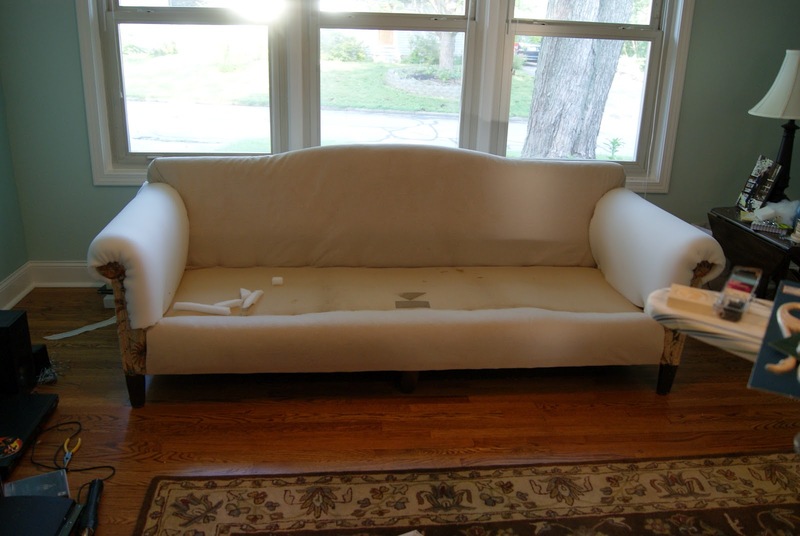 Tacking and Stapling is done to the bottom of the couch like normal. 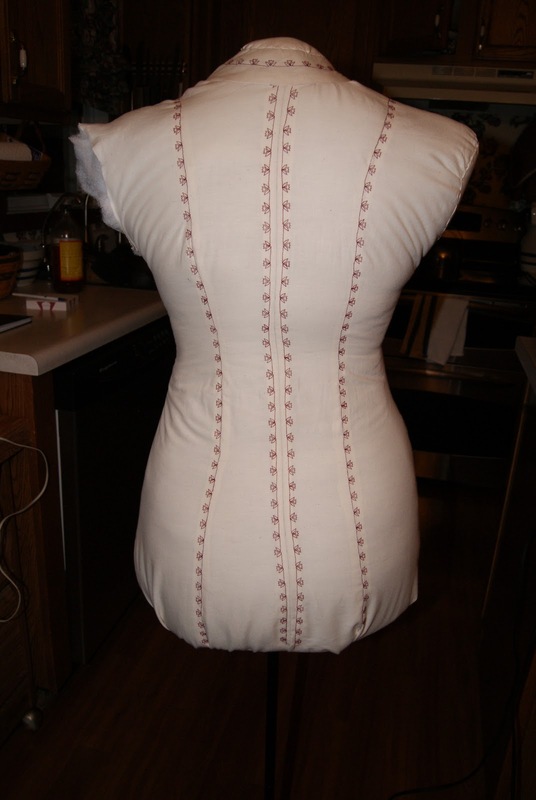 I made two more cushions for the back, using the original cushions as patterns and the original zippers for thriftiness. All in all, I think it turned out well and is just as comfortable as before! Last step before using is Scotch-Gard-ing, make sure all your windows are open and do as much as you can outside. Our house got fumey really quickly. Since the couch is practically done that ends this post. But know, that because I like to make everything harder than it should be so of course I have decided I’m going to do another, unnecessary step… adding wood to look like it is, or kind of is, an antique. But that shall be a post for another day! YAY! I finished something this break! A Rebel Symbol Scarf!!!!!!! The scarf was a request made by Devin (above) because he got a wonderfully grey peacoat and needed a scarf to make it complete. In 6 hours I created and finished this scarf while watching the BBC’s Wives and Daughters. Sometimes I feel like there is nothing to blog about. Then, while being in a completely random place I find something to blog about. Today’s topic is going to be part of my highschool artwork, Paintings. 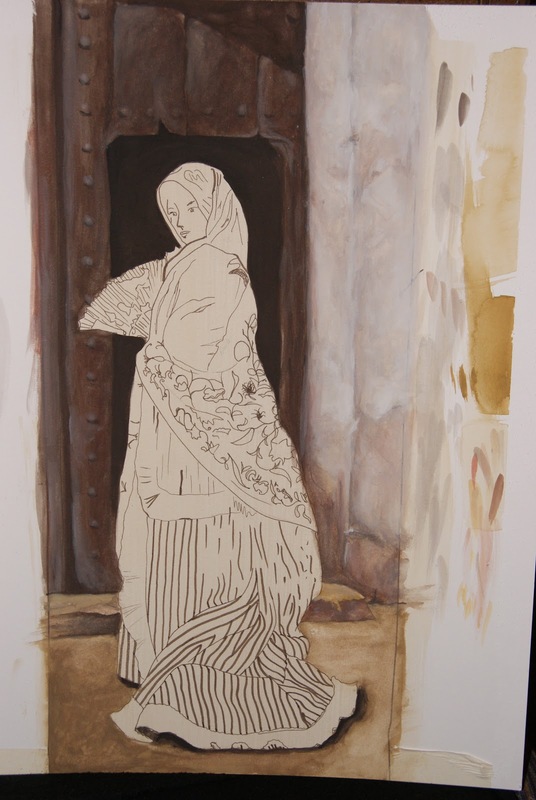 There are a few different types of paintings, watercolor, acrylic, etc. These were all done 2005-2008. I thought I would share them with you. I’m certainly not a “gifted” painter but I paint better than I can sculpt. So, when working with my paint I prefer to have a bit more control. Watercolor just gave me anxiety. Since we were getting graded on it, I had to have my painting perfect. It didn’t come out that way and isn’t even close to the rain forest photo I used for inspiration. 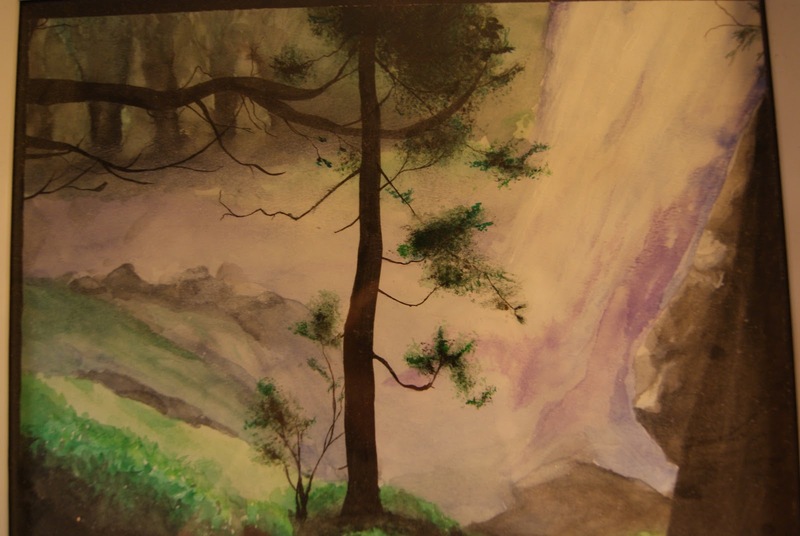 I really enjoyed working with acrylic paints because I had more control. The above painting was a completely original composition, the only direction given was 3D. I instantly thought of a beautiful neck with some huge jewelry decorating it. I loved working with the chocolate tones. So warm and comforting. I used wood for the larger pieces, beads for the smaller, and the circles are from an 80’s bracelet with spiraling copper wire. 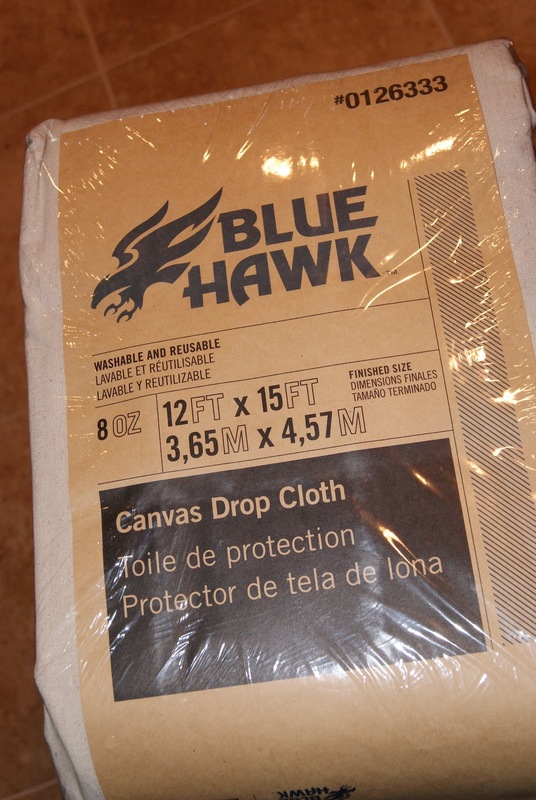 For some weird reason my canvas was cardboard and is now extremely bowed. 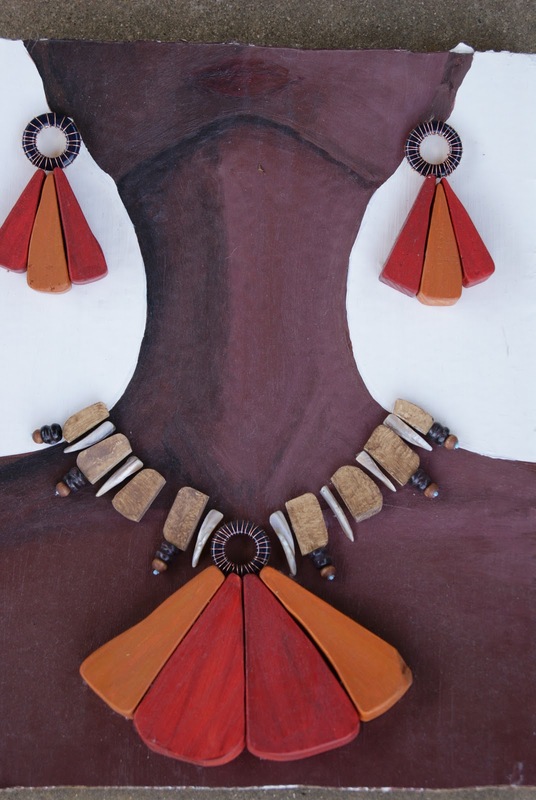 :-\ And still, although not anatomically correct and missing some beads, this remains one of my favorite pieces. 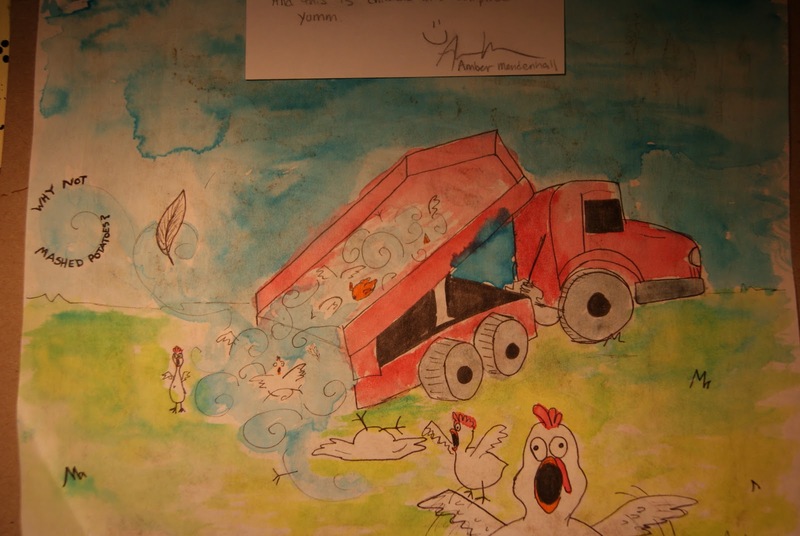 My mother’s favorite composition, “Chicken Dumplings” is from my junior year Advanced Art Class. Each quarter we were given a challenge, this one being Favorite Foods. I remember one person did a sculpture of Tacos (from Taco Johns) at war with McDonald’s foods (background being that on one of our roads, the two restaurants are across from eachother). Everyone came up with some good ones. But back to my piece, it took me an hour to think up, compose and finish, the night before it was due. 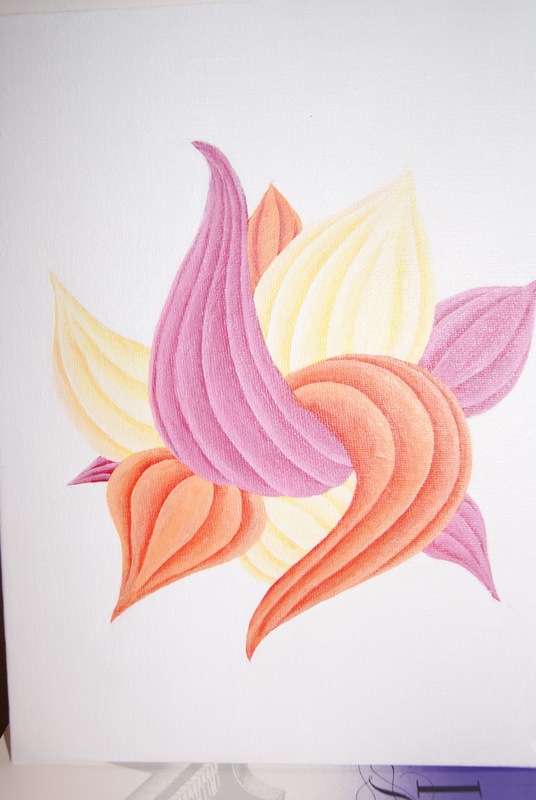 Felt tip pen and crayola watercolor paints (thank God my mom had daycare art supplies) and viola! A!!! This piece was out of boredom, and you can tell. It’s got a lack of composition and the black is far too much of a contrast with the very pale, creamy, yellow of the sun. 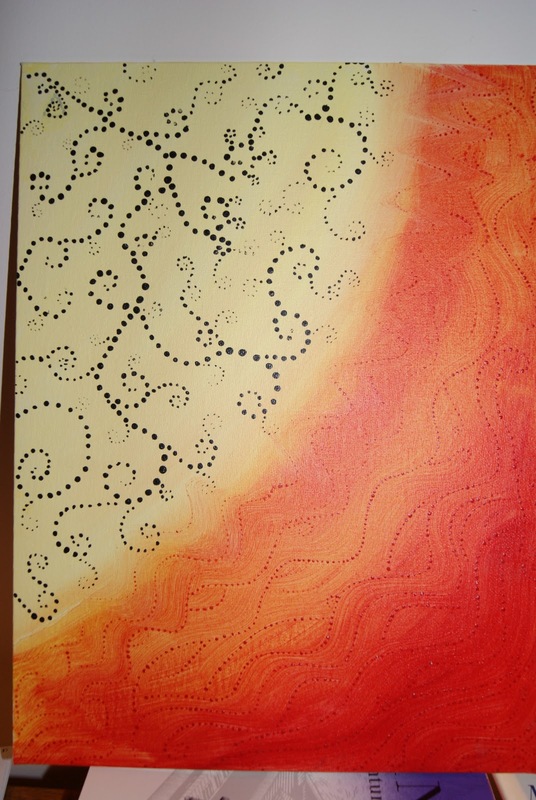 Done with acrylic, I like the reds and oranges and the dark red dots emphasizing my brushstrokes. The “Dream Flower” was just that. I had a dream with this form in it and promptly sketched out the shape on the nearest piece of paper I could find. It ended up being a really neat piece. Acrylic paint and 2 weeks of class to finish. 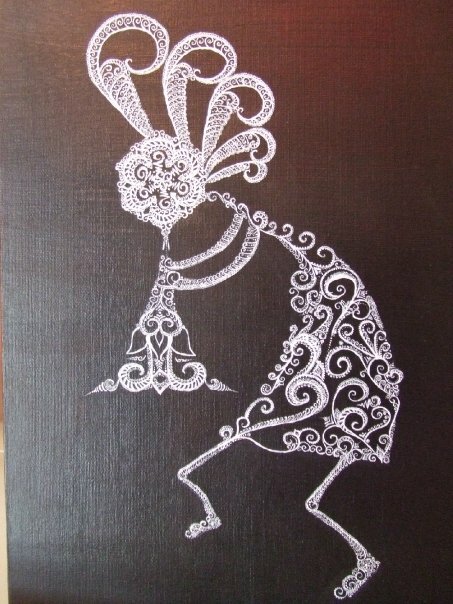 My favorite piece I ever did is my Indian henna inspired kokopelli. He took a great deal of time to do and I had to wittle down brushes to get a really fine line. Done in acrylic. This is the only picture I have of him, which is really unfortunate. I sold the painting to a teacher who has since moved and I have no way of contacting her for more pictures. I hope to recreate this painting so I have my own copy. 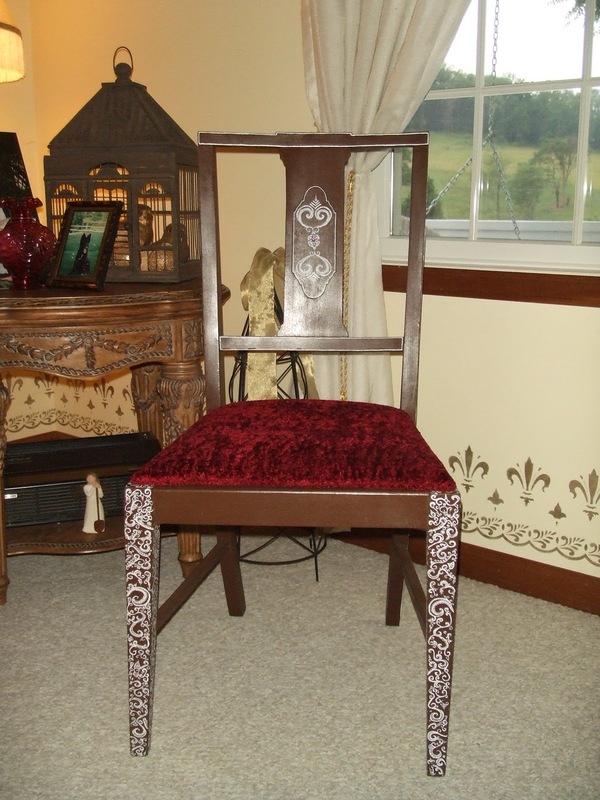 Although not a painting per se, but along the same lines, is my “Henna Chair”. I was offered to use an old chair of my art teacher’s for a project and was delighted. Done right after my Kokopelli I ran with the same designs. The original plan was to cover the chair entirely with the white details but the chair took 2 months to get as far as I did. My eyes were starting to go crossed by the end of the two months, so I decided to call it quits and hand ‘er in. My teacher was pretty impressed (at least he seemed to be) and insisted that we enter the piece into an art competition and my chair went to finals! I didn’t win anything, but saying that my piece made it to the state finals was pretty fun. 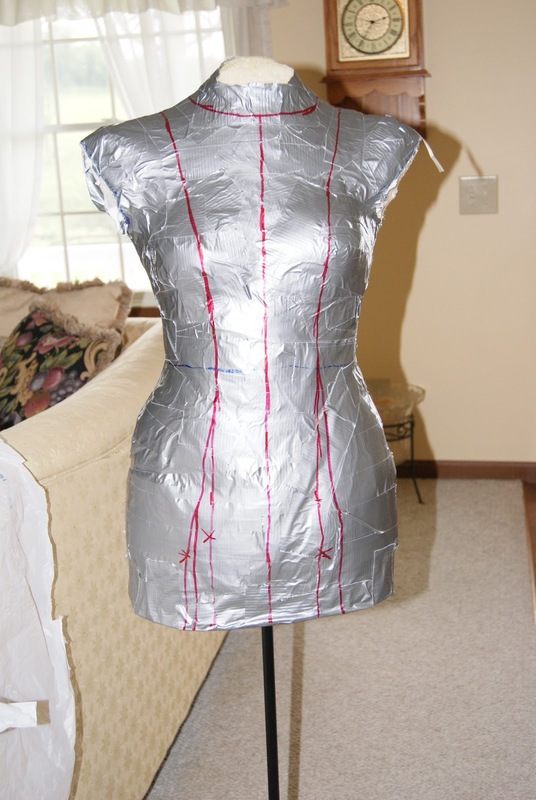 In an earlier post, I showed my Duct-Tape dress form I made of myself. The duct tape motif just isn’t my style, so 2 days ago I decided I was going to cover it. 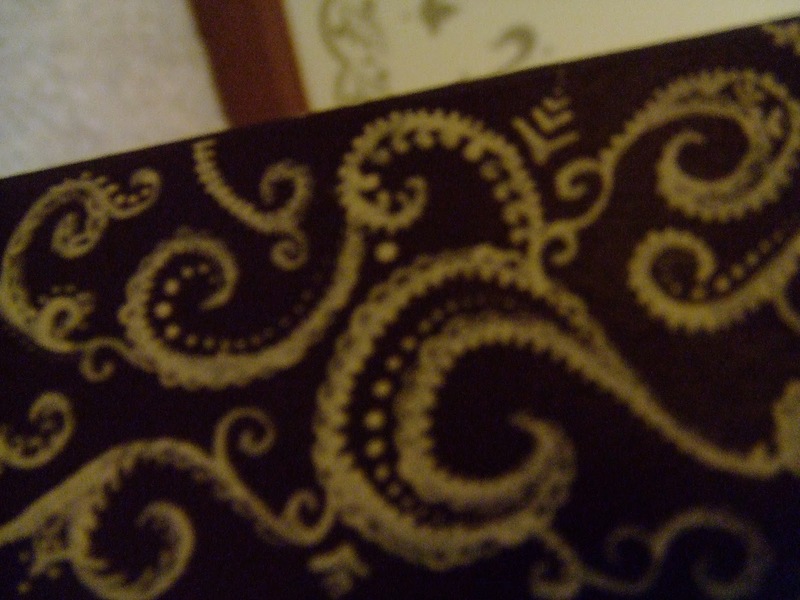 My sewing machine has a bunch of pretty stitches. So I decorated my dress form. Unfortunately it took FOREVER and had I skipped it, the project would’ve been done in a day. Sigh, my ambitious self couldn’t help it. 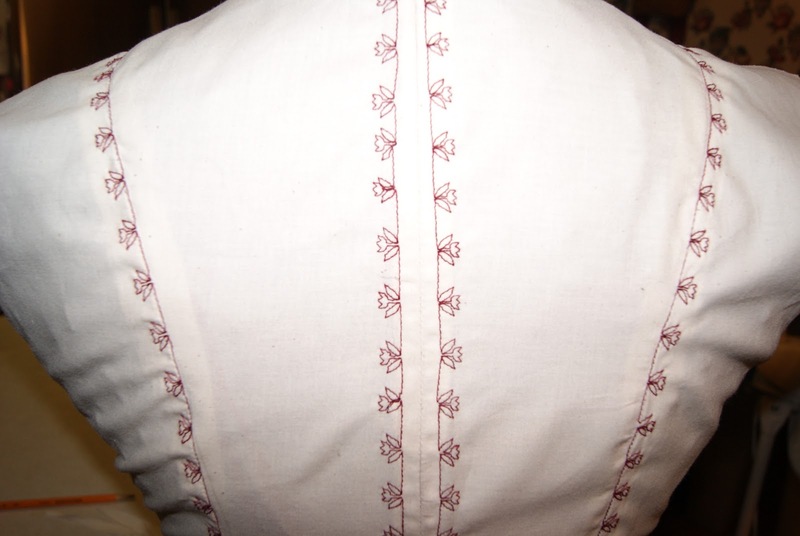 The extra stitching added a bunch of time and headache, but….. It’s pretty stitching! 2) A slightly thinner batting would have been perfect. 4) For the open parts (the armholes and neck opening) I would have instead of sewing the circles OVER the princess seam cover, I should have placed them under. It would have been a much prettier look. 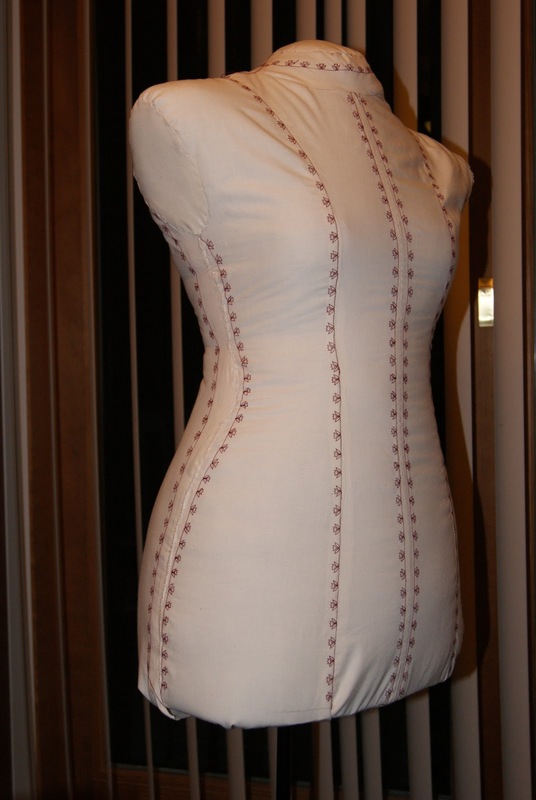 5)The dress form is a size too big. I don’t know how I could possibly fix it other than being extremely thin when you tape yourself. Overall I’m happy that I got it done (on a whim even!) I also had my first real run-thru with Princess Seams. (yay me). Of the whole project, my favorite part was and is the redwork. It made me happy. Now, after all my hard work, I have to name her. I have no clue. I was thinking perhaps Betsy or something along those lines? What do you think suits her?